WOW...S A V E about 60% OFF Ford's last new price over FIVE (5) YEARS ago ($318.00 each) with this original, USED, Mercury Capri convertible top latch / top handle! This Capri Latch is Interpretable so it fis either the RH or LH!! ***This USED Mercury Capri Convertible Top Latch is now obsolete from Ford and are no longer available through dealerships. ***Please note: These Mercury Capri Convertible Top Latches are "interchangeable" and thus each Mercury Capri convertible top latch will fit either the RH OR LH of the 1991 mercury capri convertible top frame, the 1992 mercury capri convertible top frame, 1993 mercury capri convertible top frame, and the 1994 mercury capri convertible top frame. 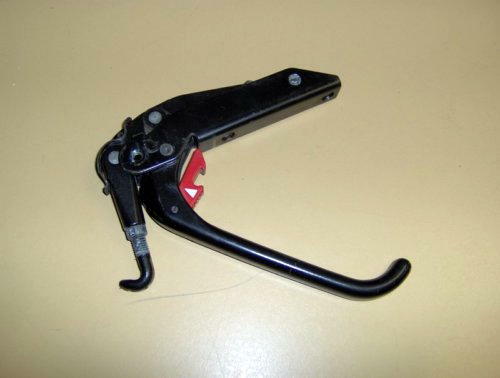 The black handle of this Mercury Capri Convertible Top Latch / Capri Convertible Top Latch tends to break typically because the hook is over tightened causing the owner to apply too much strain either pushing or pulling to close or open the latch. The hook should be adjusted, so that it clamps relatively easily while still keeping the front of the frame snug with the windshield & water tight, but not so tight that you have to force it in order to snap the handle closed or pull it open. To replace a Mercury Capri Convertible top latch, simply remove the wide Black Rubber-like cover/molding that runs across the the top of the windshield on the inside of the soft top using a flat head screw driver or small pry bar. Following, you'll see a large Phillips Head screw that holds the roof latch in place on the side of the frame, so you'll need to remove it. Next open the latch, and you'll see two small Phillips Head screws that come up underneath the latch. These screws are often rusted or corroded in place. Therefore we recommend spraying the with a "W-D" type oil and letting the soak for a while. After removing these two screws the latch will basically fall/drop out from the bottom of the convertible top frame. Finally, you'll now need to re-installl the wide Black Rubber-like cover/panel that runs across the the top of the windshield on the inside of the soft top. To do this, simply like up the plastic rivets in the molding and gently pop each back into place with the heal of your hand or a soft rubber mallet. This reconditioned, used, Mercury Capri Convertible Top Latch is becoming harder & harder to find used, and are no longer available new from Ford (discontinued). This Mercury Capri Convertible Top Latch is unavailable new at Ford dealerships. Finally although these Capri convertible top latches are "reconditioned", they are still, used, 16 + year old parts. As such as per our stated policies, they are not warranted, or guaranteed, in any way and all sales are final. Finally, please note, this Reconditioned Mercury Capri Convertible Top Latch is considered a "special order" part, so shipping may be delayed from 7-10 business days.